To buy this product, please visit your nearest stockist. Dealers - please sign in. Keep your dog securely in place and safe without fences or barriers with an Aspen Pet® Tie-out Chains They are just the thing to give your dog freedom of movement while keeping him safely contained to a specific area. Made from rust-resistant zinc-plating the chain features durable iron swivel spring snaps at both ends. 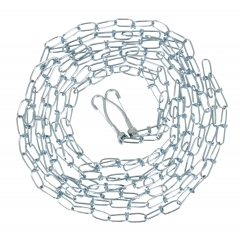 A great medium and heavyweight chain for all sizes of dogs. Use with dome stake, spiral stake, or trolley. Remember no more than one pet per trolley. Pet parents will appreciate these strong weather-resistant tie-out chains that help to ensure your dog is safe and controlled.